Mormonism was still in its infancy when Jacob Haun moved from Wisconsin to Missouri in 1835 to set up a mill in Caldwell County. The Church of Jesus Christ of the Latter Day Saints was established by Joseph Smith in 1830. Despite being quite new, the church quickly prospered, and soon a large branch was set up in Missouri as church followers moved west. Shortly thereafter, the Missouri church was designated as a “hub” of Mormonism, but as more and more Mormon families set themselves up there, tension began to rise between the Mormons and other settlers in the region. On October 27, 1838, Governor Lilburn W. Boggs issued an “Extermination Order,” telling all of the LDS followers to get out of Missouri or be exterminated. There had been numerous scuffles between the Mormons and Missourians, and presumably he thought getting rid of one of the factions would take care of it. Needless to say, the Mormons believed they had as much right as anyone else to remain in Missouri. While some families might have left for friendlier grounds, around 30 to 40 families remained at Haun’s Mill three days later. That was where 200 militia from the three surrounding counties found them on October 30, 1838. The villagers were caught unawares. They believed that a previously established truce was still in effect and hadn’t been expecting militiamen to turn up at their doors. Colonel Thomas Jennings, who led the march, denied the church leader’s plea for mercy, and the families were forced to flee for their lives. With my two younger brothers, I was at the blacksmith shop with Father when without warning a large body of mounted men with faces blackened or painted like Indians rode up yelling and commenced shooting into the group. The men at the shop called for “quarters” but the mob paid no attention, continuing to shoot. The men then shouted to their wives to take the children and run for their lives. Most of the women and children escaped to the surrounding fields, and the men, mostly unarmed, holed up in the blacksmith’s workshop. Unfortunately, the logs of the building were widely spaced, meaning the Missourians could shoot at the men inside. They didn’t stand a chance, and the Missourians were ruthless. In one instance, militiaman William Reynolds cornered ten-year-old Sardis Smith behind the bellows and shot him in the head. In another, seventy-eight-year-old Mormon Thomas McBride handed over his musket and surrendered to Jacob Rogers, who proceeded to shoot the elderly man before hacking at him with a knife. Willard was the first one to enter the blacksmith shop when the gunfire ceased. He walked over the body of his dead father and spotted his dead brother Sardis among the carnage. There was only one good thing he found in the shop: his brother Alma, though badly wounded, was still alive. All in all, seventeen Mormons were slaughtered, while another thirteen—including a woman and a little boy—were wounded. In contrast, only three militiamen were injured and none of them were killed. As if it wasn’t enough to have murdered so many people, several of the militiamen returned the next day to ransack houses and take what loot they could. Meanwhile, the women were tending to the injured and burying their dead. The Haun’s Mill Massacre was part of the larger Mormon War that took place in Missouri in 1838—a struggle between the Mormon and non-Mormons to get along. Maddeningly, when the Mormon War was at last brought to the attention of the court, Haun’s Mill was largely left out of the proceedings despite the bloody accounts written by the survivors. None of the men who marched into the peaceful village were brought to justice. Jacob Haun, the founder of Haun’s Mill, was not Mormon himself, despite the area around his mill being quite popular with LDS. His brother James ran the mill with him and later converted to Mormonism. Haun’s Mill wasn’t the end of the problems for the Mormons. 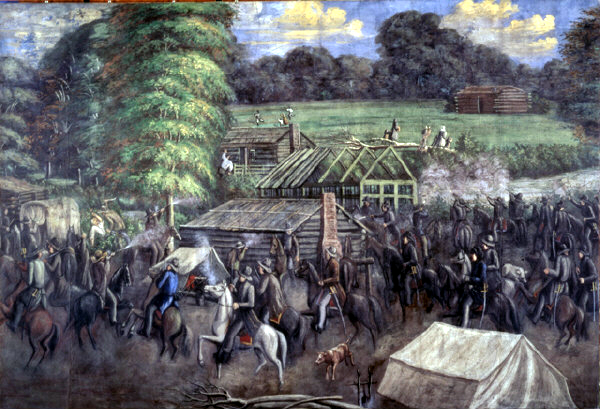 After the massacre, the families from Haun’s Mill and other areas of Missouri moved with Joseph Smith to an Illinois city called Nauvoo, which meant “city beautiful.” There they were allowed a few peaceful years to grow and prosper, but in 1844 Joseph Smith was arrested for treason after calling up the Nauvoo militia to suppress dissidents. He later died in jail when a mob broke in and killed him. This statement leaves out the fact that the Missourians (militia and mobs) were always the aggressors and the Mormons only fought to defend themselves and their families. Thank you for this detailed information. Thomas McBride was my 5th Great Grandfather. While my branch of the family left LDS in the early 1900s, it’s utterly deplorable what they did to these people in the name of religion. I wonder why all these Haun’s Mills articles are always so one sided. Why do they not tell the other side of the story? Why do they not tell the reason why the militia was called in? I am assuming that most of these articles are published by mormons and so they paint the story in their best interest. No I am not anti-mormon. I named my daughter after the names of daughters on a lady who was my best friend at one time, who was a LDS member. When these articles tell both sides of the story, then and only then will I be satisfied. I agree the stories have been one sided. and Mormon is a hate name because these people believed in the Book Of Mormon, there real name and how people should address them are (The Church Of Christ Of Latter Day Saints. I am writing a book using diaries from people that were in the mobs, if you notice also they tell about the same stories.